Final Fantasy X/X-2 HD Remaster supports cross saves between the PS3 and PS Vita versions, says Square Enix game director Yoshinori Kitase. So when you're playing on the beach and save it online, you can continue your adventure at home on your PS3. You must own the PS3 bundled version and the INDIVIDUALLY wrapped PS Vita versions for this to work. No word on cross buy packages, digital download promotions, etc. 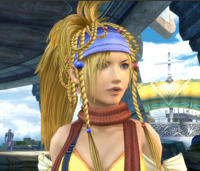 And if you are a big fan, you will enjoy hearing that there is a 30 minute animated drama, complete with brand new voice acting, at the end of Final Fantasy X during the credits. Why? And what is it about? Maybe it connects the two stories better? Still no exact release date. Are you going to pick up this title? For what consoles?